Justin Verlander is one of the more outspoken players in Major League Baseball and in his mind, Bryce Harper and Manny Machado have gone unsigned for too long. 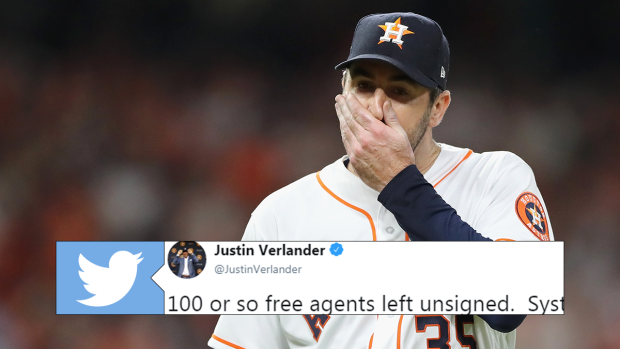 Many people involved with baseball have been concerned with the lack of free agent signings this offseason (including Alex Rodriguez and Buster Olney), but Verlander might be the biggest current name to speak out. Verlander finished second in Cy Young voting last year and is a great example of players being productive well into their 30s, so few people would say his $180 million contract was a bad decision. Which is maybe why Verlander thinks players today should get their pay days as well. Just last week, commissioner Rob Manfred was asked about the players remaining unsigned and didn’t really have much to say. Keith Olbermann did, though. Call it collusion, call it a broken system, call it whatever you want, but something is going on in baseball because in any of the other major sports two of the top young players in the league were available, teams would be lining up to sign them. Just think about all the offer sheet talk in the NHL and in those scenarios people would have to pay up in draft picks and money. Although, maybe the MLB teams would rather have people thinking 11.634 million is a lot for a player rather than thinking $30 million+ isn’t enough. Auston Matthews has signed a five-year contract extension with an $11.634 million AAV.